Chickpea Salad with Pesto is perfect for potlucks and working lunches alike. 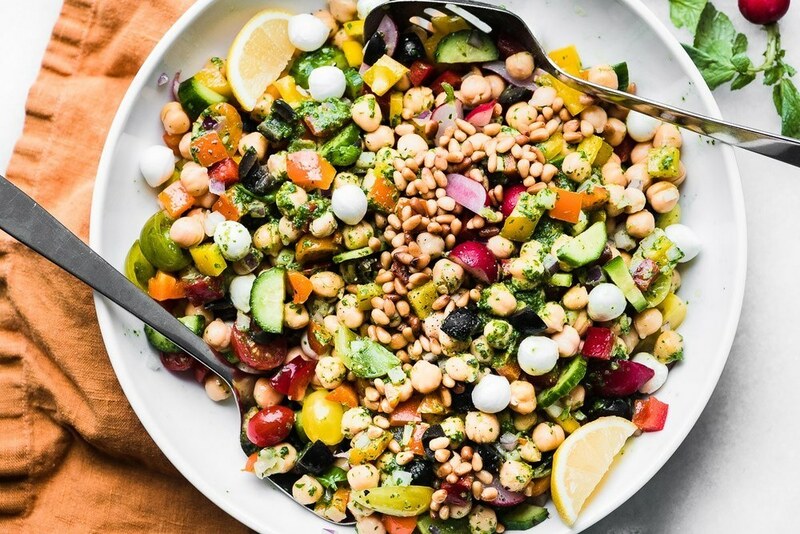 This colorful Mediterranean bean salad should be on any healthy meal plan. Put the drained, rinsed, and dried chickpeas in a large salad bowl along with the rest of the salad ingredients. To make the pesto dressing, process the basil, garlic, and lemon briefly until it breaks down into a thick paste. Add the cheese and enough olive oil to make a loose pourable consistency. Add salt to taste, and more cheese, and/or lemon if you like. Toss the salad with just enough pesto to thoroughly coat everything. Serve topped with the toasted pine nuts, a good grinding of fresh cracked pepper, and accompanied by a couple of lemon wedges.